Elian Cars | Your No. 1 Automobile Site: 4 Common Causes of Brake Pedal Vibration and How to Fix It! 4 Common Causes of Brake Pedal Vibration and How to Fix It! Some questions arise in the mind when a car shakes or vibrates. For example, where do sounds or vibrations come from? Is the steering wheel, brake pedal or other part of the vehicle not working properly? 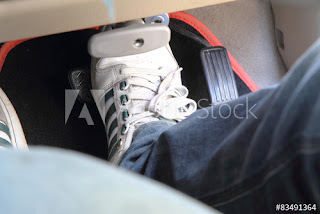 If the brake pedal shakes, this may be a serious problem that just makes your vehicle unsafe. There are many reasons for the brake pedal vibration. The only solution is to bring the vehicle immediately to the nearest gas station to avoid further damage. in the brake pedal occurs when this pedal is released. This movement in the brake varies from mild shaking to severe shuddering, depending on the severity of the condition. To your relief, here are some causes that can help you to find the main reasons for the question "Brake pedal vibrates when braking". If the brake maintenance tips are followed, these issues can be kept in check. Each caliper of the wheel has two brake pads, with the friction surface of these pads facing the rotor. Then, when the brakes are applied hydraulically (in simple words, the brakes are put into operation with liquid oil), then the caliper tightens the brake pads together on the rotating rotor to stop the vehicle. However, if the pads are contaminated with oil, dirt or other substance, then the brake pedal vibrates during the clamping of the pads in the rotor. In addition to this, wrapped, damaged or excessively worn pads can also be one of the causes of the vibration of the brake pedal. How to correct it: You must disassemble the brake and then clean it to remove all dust, rust and other contaminants. Getting rid of dirty things allows the car's brake to work more smoothly. In case you cannot help, however, your last option is to replace your pads. The rotor part of the brake system is important. Therefore, it is critical for the overall safety of the vehicle to be properly maintained. This rotating part of the one-wheel disc brake assembly works against the brake pads. Typically iron gray (a form of cast iron), the rotor works to decelerate / stop the vehicle. It is hooked to the hub of the wheel, so this rotor rotates in the direction of the wheel. When the brake is applied, the rotating rotor reduces the speed of the vehicle using the friction of the direct contact with the pads. Therefore, poor rotor condition can cause the brake pedal to vibrate when stopped. However, if this part of the system is marked, cracked, deformed or excessively oxidized, it can cause an uneven grip of the brakes, which can also produce squealing or pulsating sounds, when the brakes are applied. How to correct it: brake rotors need to be repaired or replaced. Replacing or resurfacing both rotors (front or rear assembly), even if only one of them is in poor condition, is crucial. New brake pads are highly recommended when replacing rotors because the worn surfaces of the pads will not make contact with new and smooth rotors. It takes time for the surfaces of both sides to line up correctly, if not replaced in unison. The aligned tires of the vehicle obey perfectly the steering wheel. On the contrary, when there is a disorganization of the tires, they tend to produce screeching sounds. This unpleasant sound or vibration is caused by the rubbing of the wheels against the brake pads, when the vehicle is decelerated. Therefore, it must be treated at an early stage before the braking system malfunctions. How to correct it: For balance problems, an indispensable process is the alignment of the wheels. The application of an inspection will show what type of alignment you need, a two- or four-wheel alignment. Commonly, a 4-wheel alignment is applied to SUVs, while cars only need an alignment on the 2 front wheels. In case your rear axle is damaged, or the car's own chassis, it is crucial to carry out a four-wheel alignment. Once the brake pads become thin or there are scars or cracks in the face of the rotor, taking the vehicle to the nearest service station would help solve the problem of the vibratory pedal. In addition to these mentioned causes of brake pedal vibration, worn ball joints, tie rods, wheel bearings and other parts of the system can also cause brake problems.